Renown brand author, speaker, and advisor Martin Lindstrom joins me today to talk about the ways marketers manipulate customers and what we should do about it. 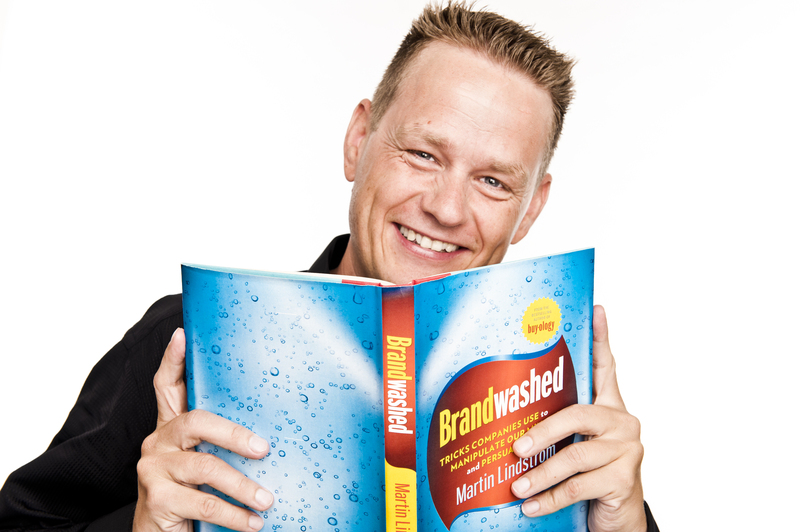 The topic is the subject of Martin’s latest book, Brandwashed: Tricks Companies Use to Manipulate Our Minds and Persuade Us to Buy. From the reports on secret data-mining to chemically addictive make-up to fetus-targeted advertising, the book reads like a tell-all on the secret marketing lives of today’s companies. It raised so many questions for me, so I’m pleased to share this interview. Listen in to hear about his findings and how he thinks consumers and marketers should react. I’d really like to know what you think of Brandwashed and I have an extra copy of the book that I’d like to share. So I will send it to whoever is the first person to post a comment on my blog or send me an email about this interview. Hello. If you are into brands or branding at all, you have probably heard of my guest today, Martin Lindstrom. He is a world renowned advisor, speaker and author. Two of his books at least have influenced the thinking of many brand builders, including myself, those being “Brand Sense: Build Powerful Brands through Touch, Taste, Smell, Sight and Sound” and more recently “Buyology: The Truth and Lies about Why We Buy”. Today he is joining me to talk about his latest book “Brandwashed: Tricks Companies Use to Manipulate Our Minds and Persuade Us to Buy”. From that title alone you can probably get a sense of how provocative the book is. Martin reveals the secrets like how marketers target babies before they are born and how cosmetic products use addictive ingredients to hook consumers, and how strongly people are influenced by their peers. That last point was actually the subject of a three-month long social experiment in which Martin hired actors to pose as a family and peddle products and brands to their unsuspecting neighbors in suburban Laguna Beach. So it is all very fascinating and the book has raised so many questions for me. So I am glad to have the opportunity to speak with Martin today. So, welcome, Martin. Martin: Thank you so much for having me on your show. Denise: You are welcome. Your book, as I said, includes many controversial findings. I cannot even begin to list them. So I am hoping you might give me and my listeners just some highlights, maybe by talking about what are some of the most surprising things you found in your research? Martin: I think for me the three most surprising mentions that have been identified in the book as part of my research, was first of all how some companies are using addictive chemicals in the product manufacturing processes, in order to make us become addicted to the product. One example I am pointing out in the book is how a lip balm brand called Carmex, which some of you may be familiar with, indeed is not just good to use, but we actually do become addicted to it. The reason is they add a chemical to the formula which eats up dead tissue and living tissue on your lips, and that is what has been stopping us quitting the lip balm mania we all have. What is surprising in the book is, of course, that the company which is producing this even admits that they are doing it. To me that was a shocking revelation because it shows how desperate some companies are in order to secure an audience and sell to them. Another aspect in the book which I found fascinating but also scary was the whole privacy issue. As I was doing the research, I realized how concepts like super cookies now have become a reality. Basically, it is a piece of software which is placed in your computer that can overwrite previous instructions that you have given, for example, “Delete cookies.” Cookies can remember where you were in the past, what websites you were looking at and stuff like that. Now these super cookies actually overwrite that information, recover all your historic surfing activities, and can send it back to advertisers in order to, I guess, target you and I more. One of the other things I was fascinated by was, as you were pointing out just a couple of minutes ago, how we now have evidence that some marketers indeed are targeting pregnant women in order to prime their unborn babies to have a brand preference even before they are born. It sounds like a scientific movie, a scary movie from the future, but I also have to admit to having done a lot of research on this topic. We interviewed more than 50 different psychologists, scientists, and pediatricians. We have learned that this probably is very much the truth. Denise: It is scary, but I realize it is the reality. Right? Martin: It is very much the reality and what we have learned from the last topic is actually indeed that while we are still in the womb of our mother we are today affected by the sense of taste and the sense of sound. Several papers have been published on that topic and peer-reviewed. We also do know from other studies, for example, a study conducted recently that if you are watching a certain TV series which has a very strong signature tune associated with it, and you do that during pregnancy, in fact the new born baby later on will have a preference when watching this show, they will not only be calmer, they will also be more attention seeking after that, compared to control groups. Indeed in the book I am pointing out companies like a coffee company in Asia called Coffeeco which produces coffee and candy and is infusing a branded sound and smell of candy into mother’s behavior, when they eat this candy when being pregnant, and the baby generates an unconscious preference for this candy and later on for this coffee brand, after the baby is born. It is very scary stuff we are talking about. Of course, that is the reason I am writing about it in this book because I want everyone including the marketers to be aware that for some time things have gone out of hand, it has gone too far and it is disgraceful for us the sell products. Denise: So that does speak to the questions that I have had for you. I am curious as to first, what is the appropriate consumer response to your findings? What do we do now that we know this? Then on the flip side, what is the appropriate marketer’s response? Martin: I think the appropriate consumer response is that consumers should be aware that they are not immune. I think a lot of consumers believe because they have been shopping for such a long a time. They have been exposed to so much advertising. They believe they are perfectly able to avoid all the tricks and traps that are set out by the industry. But guess what, it is when you reach that stage in your life that you are the most affected by these promotional messages. I think the book will create a wake-up call for you as you read it because you will realize, “Gee, I am actually affected by that, and that, and that, and I don’t know this trick was played on me.” So really you will realize hopefully that a lot of stuff is going on without your awareness. So number one, do not be fooled. Do not think that you are immune to things. I think from the marketer’s point of view I have issued a set of new ethical guidelines which I am using to educate my clients with right now. You see I am the one who is the evil guy. I am a marketing guy. I am a branding guy. I am not doing this to sell books necessarily. I am doing this because I do believe we have gone too far right now, and someone needs to draw the line in the sand. Now there are two different ways you can draw the line in the sand. You can scream and shout or you can work with the industry. I am actually trying to do both. I am trying to educate the industry across the world about how fast they should go and how fast they should not go. So by introducing a range of new ethical guidelines, which actually have been developed by 2000 individual consumers across the world, I feel hopeful that we will see a whole new standard being adapted by companies across the world. To just sort of give you an insight here I spoke to one of the largest companies in the world a couple of weeks ago, introducing these ethical guidelines, and immediately they decided to adapt all ten of those guidelines as a standard approach worldwide. So that actually made me proud, because already now I can see a change. But I think also for consumers the most important thing to be aware of here, is that they should keep an eye on those companies who are doing the good stuff and support that more. There is so much confusion out there, and I do not think those companies who are staying within those ethical guidelines are getting enough credit for it simply because the noise is so big so we do not know are they. Denise: So consumers can actually become advocates and promoters for those companies that are trying to be more conscientious about what they are doing? Martin: Absolutely. I think it is rare it is happening. I think there is a tendency either that we have given up as consumers, and just do not care anymore. Or alternatively we are screaming and talking about all the bad stuff. That is very rare to see consumers raising their hand and saying, “We love that company, and we love their ethical standards” and I wish the rest of the world will listen to them. That is also what I am encouraging here. Martin: Well, I have to admit that I have not come across one single person saying that. Martin: Yeah. So I have not really felt that. The only thing I have seen happening now and then is that some people are saying, “Wow! Is that it? I would not manipulate you with more.” But that is part one out of hundred reviews saying that. The other 99% of the people are saying, “I am shocked.” I would say that if that comment were to come across to me and if I take your example on board in terms of you being navigated by people, I would have to disagree with that. The reason why is this: Let us take a scenario like Google Gmail. If you for example write an email, let us say you write an email and you use the word “nice” quite a lot in that email, and you are talking about travel and trips. Google as you know today are allowed to monitor your entire email, and to capture those key words and use them for advertising purposes, they will know the context that it is not ‘nice’ that you are writing about, you are writing about a city called “Nice” in France, spelled the same way. They will know that because you talk about travel as well and that is the reason why they will put up an ad talking about three trips or two trips to Nice. Now, let us say you buy that and let us say they are monitoring how your friends are talking about Nice as well because of you, and in fact they have started to buy trips as well. Then they are able to figure out that you are a person who has a stronger influence on your friends and in fact categorize you based on your influence. If you take a look at what is happening now is that a company like Facebook is going to develop a new application which allows you to see what your friend is watching right now, or allows you to listen to the music which your friend is listening to right now. That means now all of us will basically keep an eye on what all of us are doing all the time. I am sure that some people would find that positive, but what is sneaky about this is of course that if I am releasing a new movie and I am starting with 600 people on Facebook and I can see that 423 of those in fact had a huge influence on people around them, and that was a reason why that movie spread to another 2000, another 10000, or another half a million people. But they know which people have the strongest influence on us and which one has least influence on our community. Combining all the data from Gmail and Facebook with stuff like this more influence than others. So the next time I am releasing a product, I will only talk those 600 different people because they will control the entire word of mouth online. Then, it leads me back to my question to you, if you happen to be influenced by your friend who by the way is influenced by two other people who are seated or primed into the community, so in fact their real opinion is not really the opinion they have, but something that they have been influenced by other people. Just to put that into perspective as you probably remember in the book I am talking about how 200 people were put in to a room, asked to walk around random and five people were then instructed to walk around the room clockwise without saying anything to anyone and within seven minutes the entire room was walking around clockwise and no one had an idea about why they are doing it. Well, then it gives you an indication of yes, it may be that you choose a product based on what your friend picks, right. But then my question is, is that really the full truth? Denise: Is that really choice, or is it manipulation? Yeah. Conformity unbeknownst to the person, right? Denise: Wow. Let me actually ask you a last question. The forward of your book is written by Morgan Spurlock and I found that just as fascinating that you would have him write your forward, and just curious to hear what do you think of his movie “Pom Wonderful presents The Greatest Movie Ever Sold” and what he is trying to do, and how that may differ or coincide with what you are trying to do? Martin: Well, Morgan contacted me a couple of years ago, because he wanted me to be in that movie, so I am featured in his movie. I loved his concept, because it actually is looking at the industry in a very different light using his signature humor, and his very simple language. Unfortunately the movie has not sold as well as everyone was hoping. It certainly gives you an interesting insight into the concept of product placement. I feel that Morgan Spurlock more and more is trying to give a pretty objective view about the life of a consumer. I felt Morgan Spurlock to be the appropriate person to put a foreword in my book because he adds a view to the commercial world which is probably just as hard to choose as the view what marketing people are adding to part of this world, meaning that not every brand is healthy, not every product is healthy, and yes, there are some rotten eggs in the basket, of marketers and brands that are going too far and I think he has the ears among the audience who are willing to listen to what he has to say. Because my book is admittedly critical and at the same time hopefully constructive, I felt it was appropriate to involve him. Now at the end of the day, I realized one thing. If I wanted to introduce the concept of ethics into the world, the last thing I should do is write a book about ethics. That is the reason why instead I have written a fun book, and an interesting book hopefully, and hopefully you feel the same, which is incredibly informative, but it also gives you a lot of high moments. I feel that Morgan Spurlock is setting the right tone of voice because that is really his tone of voice as well. So, yes, we are a very odd couple coming from two different worlds, but hopefully by us combining, people will see both sides of the world rather than just one side. Denise: Great. That makes a lot of sense. Well, for my listeners I want to encourage you to look up Martin at his website, martinlindstrom.com, and also encourage you to get a copy of his book and let me know what you think about it. Actually to that end, I have an extra copy of Brandwashed that I would like to share with one of my listeners. So whoever is the first person to post a comment on my blog or send me an email about this interview, I will send you the copy. Martin, thank you so much for being here today, for sharing your provocative perspectives and I am just thrilled to hear the back story behind your writing. I wish you the best with your book and the many works for you to come. Martin: Thank you so much for listening in for some really good questions. Good luck with the show.